While there are no Electric Vehicle (EV) manufacturers listed on the Australian Stock Exchange, Australia has a number of companies that participate in the most exciting part of the supply chain where I believe the bulk of value will likely accrue through the cycle. This sector is comprised of the raw material providers to the lithium-ion battery industry, the companies that provide the commodities for not only the electric vehicles we will all drive in the not too distant future, but also the stationery storage devices and all consumer electronics products that are ubiquitous in today’s world. At Regal, we've been investing in this part of the market for a number of years. While it has become more mainstream now, I would like to outline the reasons we remain invested, and what got us interested in the first place. What’s driving the EV thematic? To begin with it's worth taking a step back to understand why we think this is not just a theme that will come and go, but a theme which we think has genuine longevity. The first is: the world is urbanising. Obviously, urbanisation commenced well before China started doing it, but that gave global urbanisation a huge kick along, and we've now got more people across the world living in cities than those living on farms. While there are many ramifications of this, one of the worst consequences is an increase in pollution. Clearly that's a massive problem for the world, causing widespread health and social issues, and this has started driving unprecedented policy response. One of the hotbeds of the pollution issue has been carbon dioxide emissions from internal combustion engines. Various jurisdictions globally are targeting a large reduction in carbon dioxide emissions, mandating that they be reduced by almost 50% by 2025. Clearly the internal combustion engine isn't what it used to be in the mindsets of global decision makers, as it is one of the major contributors to global carbon dioxide pollution levels. As well as being quieter and significantly more powerful, one of the most important features of EV engines is their superior efficiency. For every unit of energy input into an electric motor, 70% of the energy makes its way through to the drive shaft, as opposed to the internal combustion engine which is only 20% efficient. EV engines appear to be an elegant solution to the transportation problem, as well as being a much cleaner and environmentally friendly option. Legislators all around the world are looking to phase out the internal combustion engine, or at the very least, to ban sales of new internal combustion engine cars, which will lead to a phased exit of this technology from our roads. The following is a list of some of the countries and regions that are doing just this (note that the USA reference relates to California only, but this is likely to be followed by other states). 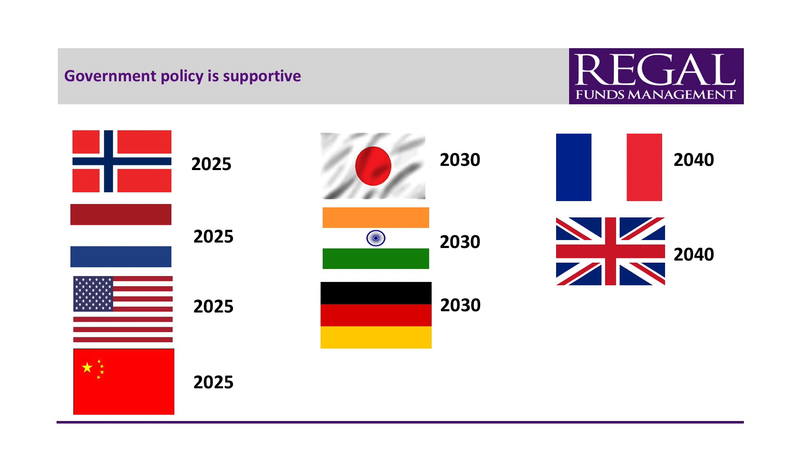 While many might think that this is a long way off in the future, focussing on the years in which these countries will be banning the internal combustion engine shows that it’s actually starting to happen right now. One of the big impediments to EV penetration in the past has been that the prohibitive cost of the battery. Half to a third of the cost of an EV is in the battery, and bringing the price of the battery down will make the vehicles more affordable for the end users. What we've seen in the last seven years has been a tremendous reduction in the cost per kilowatt hour of the batteries. We expect a further 40 to 60% drop from current prices, which will mean that within the next five years, subsidies will likely no longer be required to help stimulate EV sales. That is, EV and internal combustion engine vehicles will stand toe-to-toe in an economic sense. The battery industry anticipates this, and is responding to the huge increase in consumer and policy demand, with a five-fold increase in plans for battery manufacturing facilities between 2015 and 2020. 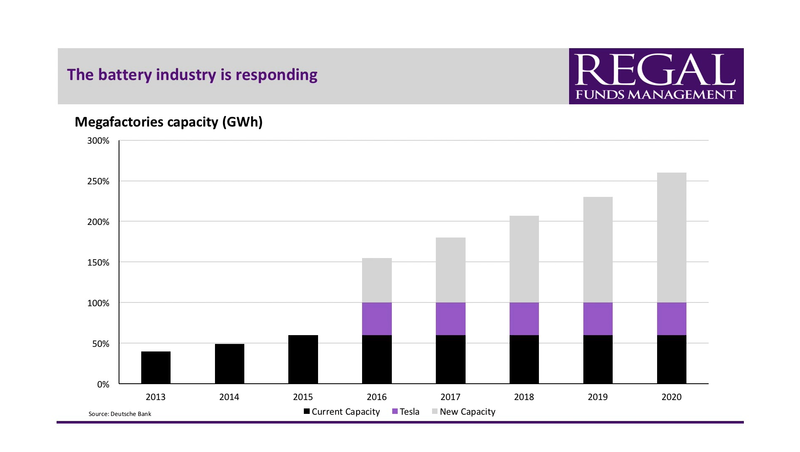 Looking at the following chart, while Tesla holds a bulk of the market share in the industry, the real mover and shaker is without a doubt, China, which is bringing on the largest addition of new battery capacity globally. The battery industry has seen what is coming, and this has emboldened the global auto-makers to follow suit. We've basically seen every global auto manufacturer, in addition to a raft of new auto companies, commit tens of billions of dollars on new facilities that can only manufacture electric vehicles. We are witnessing a comprehensive and revolutionary re-engineering of the entire global auto manufacturing industry, which is 100% supported and championed by global policy makers. The future has arrived! Looking at the data, 2017 was the first year where a million electric vehicles were sold globally. Growth rates are now accelerating with quarter on quarter increases late in 2017 of 60% year on year, and over 20% quarter on quarter. It is difficult to deny this is happening. China is not only the driving force in battery manufacturing, they have also sold half of all global EVs in the past year. We remain surprised that some investors think that this is a transient boom. We think the compounding effect of the requirements for battery materials on the back of increased electric vehicle spend will go for many years, and this suggests that commodities demand for some specific battery minerals will far outpace mine supply over the medium to longer term. What goes into a EV battery? The diagram below displays the breakdown of the two largest components of an NCM battery, which is one of the more popular batteries in the market. It has seen broad acceptance because it represents a good mix of both range, which is how far you can drive without charging, and also power, which is how fast you can extract the energy out of the battery to drive the car (think of this in terms of acceleration). 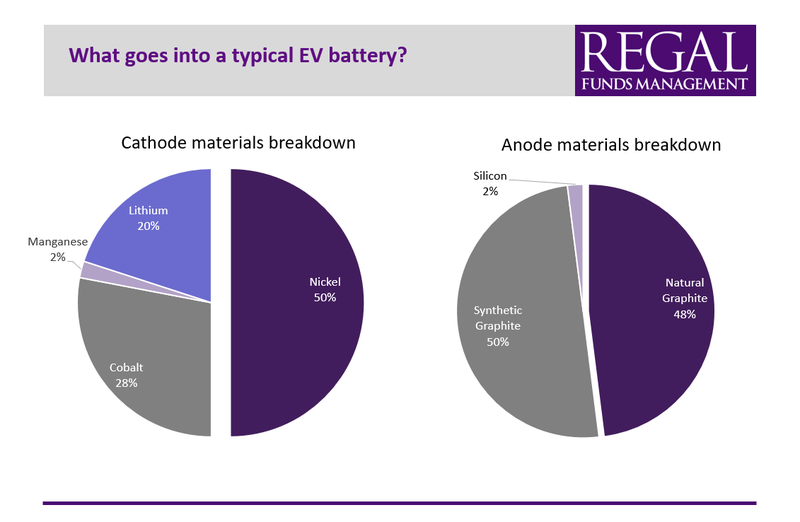 Approximately 60% of the battery is made up of the cathode and anode, and they're the two areas of the raw materials supply chain Regal is most focused on from an investment point of view and really the only way we can get access to the battery minerals commodity explorers, developers and producers listed on the ASX. The pie chart on the left shows that nickel comprises approximately 50% of the cathode. Nickel is a relatively large global market (compared to other battery minerals), so while a lot of benefit will flow to nickel markets through increased demand, the largest increases of demand will be felt in the cobalt and lithium markets. The expected increase in demand in the cobalt, lithium and graphite markets is staggering and worthy of more work and analysis. The anode, represents 20% of the battery. It is important to note that the anode is made up of both synthetic and natural graphite, in a roughly 50/50 ratio. The best batteries of today have, and are expected to always have, a combination of the two. Synthetic graphite is very high-cost, and is used to provide the driving range to a battery, whereas natural graphite is much lower cost, but provides the power attributes of the battery. Our analysis of the global battery market suggests that very high quality natural graphite will gain a larger share of the standard anode as the world trends towards higher-performance batteries and vehicles. But this isn’t the only reason we remain highly optimistic on the demand for natural graphite. One of fundamental underlying reasons we are and remain bullish on the outlook for these commodities, is that over the medium to longer-term we anticipate large deficits and subsequently undersupply. In the short-term, the next 3-5 years, the industry may adequately find enough cobalt, lithium, and graphite for all their expected uses and demand profiles. Prices have initially risen quite dramatically, which has stimulated an increase in supply. The numbers in the following chart, compiled and aggregated from a number of large global investment banks, demonstrates that if EV penetration does take off, there is going to be a chronic under supply of these raw materials and that's extremely attractive to us as a fundamental, high conviction investor. We expect, that higher prices are likely for cobalt, lithium, graphite and nickel. All markets will adjust and supply will ultimately respond, but we subscribe to the view that prices are unlikely to return to long run historical averages in the near term, as the miners need structurally higher prices for prolonged periods to incentivise the large increases in the supply of these commodities that are needed to satisfy the unprecedented demand driven by EV penetration. Further, chronic undersupply typically heralds high levels of corporate activity, from traders and end users who appear desperate to lock up supply. We expect this M&A theme to commence sooner rather than later. We are hearing numerous tales from junior and mid-tier mining companies who have some of the world’s largest auto manufacturers touring their mine sites. This news is quite surprising. It is almost unprecedented that car companies should be spending their time worrying about the underlying commodities that go into their vehicles, as it’s not a part of the supply chain they have ever had to worry about. The only reason they're doing it is because they're worried about where they're going to get the raw materials for their batteries from. What they can’t afford to see happen is their shiny new electric vehicle manufacturing plants sitting idle or running at anything less than capacity because they can’t access the raw materials for the batteries. It would be like an auto manufacture of yester-year building a new car factory, and then suddenly realising there is not enough rubber in the world for the tyres! In our view, there's is only one genuine graphite company and that is Syrah Resources (ASX:SYR). We have been a large investor in this company for a number of years, and while it has been a volatile ride at times, Syrah has now emerged as the only fully funded, and clearly the highest quality graphite company in the world. They are now in production and ramping up, and are ideally positioned as the only true source of large tonnage, high-quality natural graphite to the global electric vehicle industry, they also happen to be the lowest cost producer on the planet. We continue to see a large potential upside in the stock from current levels, as it continues to re-rate to earnings multiples more in line with some of the other battery minerals companies globally. We have been invested in the lithium sector for a number of years. While in recent times, many share prices have had large re-ratings we have used this increase in prices to re-allocate our exposures within the sector. Our most interesting investments in the sector at the moment are companies not yet in production like Pilbara Minerals (ASX:PLS). Pilbara will be in production in coming months, and it has a globally significant asset base, trades on earnings multiples that are at a steep discount to peers (which are in production), and which we think will see a significant re-rating once production and cash flow is achieved. A company that is less well known that we think has globally significant attributes is Global Geoscience (ASX:GSC), listed here in Australia. Global Geoscience has a lithium asset in Nevada, and it’s a very large orebody that should lead to a long life mine and processing operation. It has a unique mineralogy that sets it apart from almost all other lithium deposits globally. We continue to do ongoing analysis on the company, and believe it has potential to be one of the largest and lowest cost lithium and boron projects anywhere in the world. We see a significant potential re-rating for the company in coming years as it confirms the simple metallurgy and flow sheet that we believe it will enjoy and de-risks its project through announcement of detailed project studies, ultimate funding and then production. 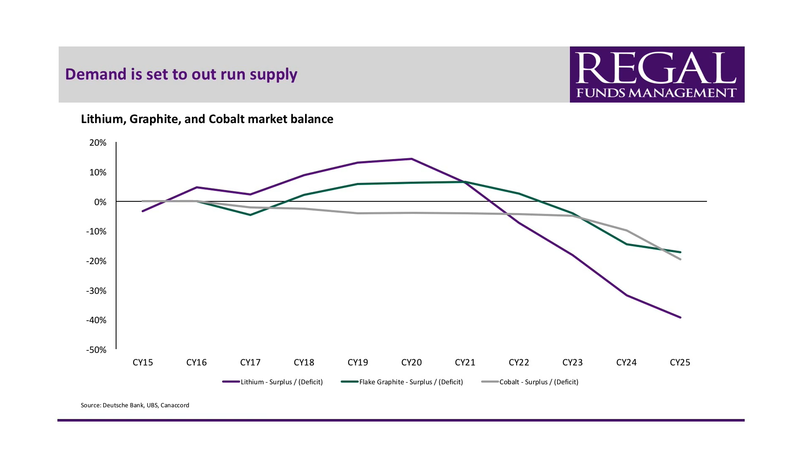 The cobalt sector remains a very nice sector in the Australian market. Our preference currently resides at the more junior end of the market, where we think some of the more exciting investment propositions reside (but with commensurate higher risk). A great example of these types of companies is Aeon Minerals (ASX:AML). Aeon is exploiting a Queensland based copper project with relatively high tonnage cobalt. Another company we like is Jervois Mining (ASX:JRV), which has a project in New South Wales that is nearby some other listed peers, but Jervois trades at a fraction of their price. The company is also actively looking for growth via acquisition, which may lead to further value accretion. Those are just a few ideas we're excited about, and hopefully this has provided a deeper understanding for why Regal is invested in the battery minerals related sectors. We genuinely believe that this is a sector that will continue to grow and have strong fundamental drivers for many years to come. Julian, there is one electric vehicle manufacturer listed on the Australian stock exchange:the electric scooter manufacturer and distributor, Vmoto (VMT). Thanks Julian, on top of that great analysis lets not forget the players in the EVSE Industry which are also set to benefit from this "EV Megatrend". 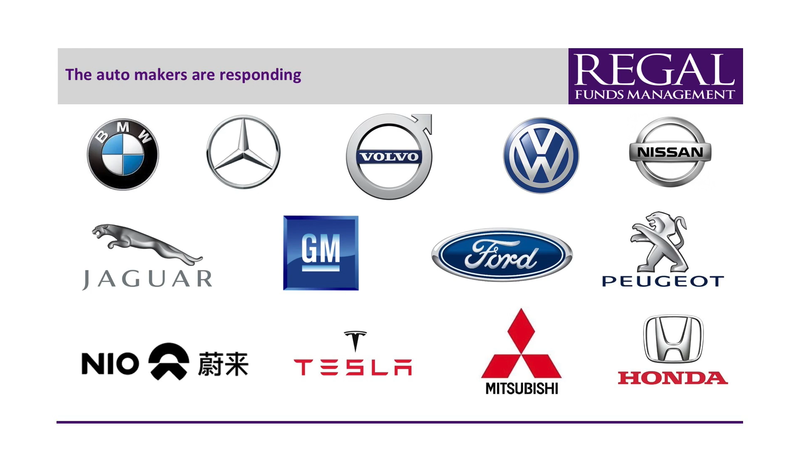 Rectifier Technologies (ASX:RFT), the only listed EVSE supplier and component manufacturer listed on the ASX. I was surprised you did not choose GXY or ORE for lithium and COB for cobalt. Another likely beneficiary is LPD in the lithium refining area. I agree Frank, Galaxy and Orocobre were in the lithium space when there wasn't much interest in the commodity, and so it is fair to assume that their lithium assets sit somewhere near the top of the totem pole. I also agree with most of Frank's selection. The following are also worth considering- Lithium -Kidman Resources KDR Graphite - Base Metals Ltd BSM & Mineral Developments MDL Also of interest is Technology Metals TMT which is setting up a Vanadium Mine in WA. Great article thank you Julian, my big concern is that now one is talking about the recycling of these millions of batteries.